In UML diagram, Object diagrams describe the static structure of a system at a particular time and they are used to test the accuracy of class diagram. It is a graph instances, including objects and data values. Class Diagrams are related to Object Diagram and uses identical notation as class diagram. But the main difference between these two diagrams is, the Object Diagram shows the object and the class diagram shows classes. It provide static view of an interaction. It understand object behavior and their relationship from practical perspective. It shows the object relationships of a system. Object Names: It is same as the class name in class diagram but with the object name attribute are also assigned. Object Attributes: Use cases describe the relationship between the system and the actor during the execution of business processes. Active object: Objects that control action flow are called active objects. Illustrate these objects with a thicker border. Multiplicity: We can represent multiple objects as one symbol if the attributes of the individual objects are not important. Links: Links are instances of associations. We can draw a link using the lines used in class diagrams. 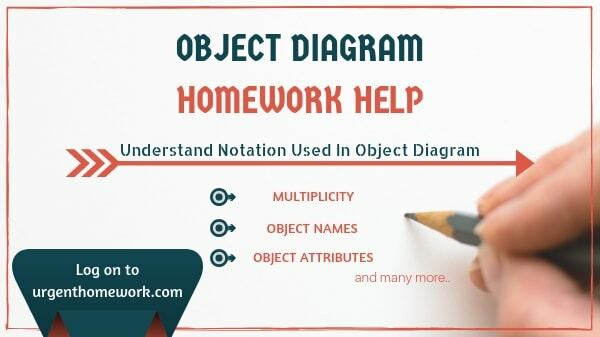 If you need homework, assignment, coursework help in Object Diagram contact our online chat support.